Have you noticed? Athleisure is just getting hotter. Designers are finding innovative ways to work into their lines sweat pants and even tube socks (Gucci). And in street fashion, sneakers totally outnumber stilettos. While recently blogging about sneaker street style, I realized that I simply had to dedicate a post entirely to Converse. After all, Chuck Taylor is the daddy of sneaker street style, an archetypal sneaker if there ever was one. 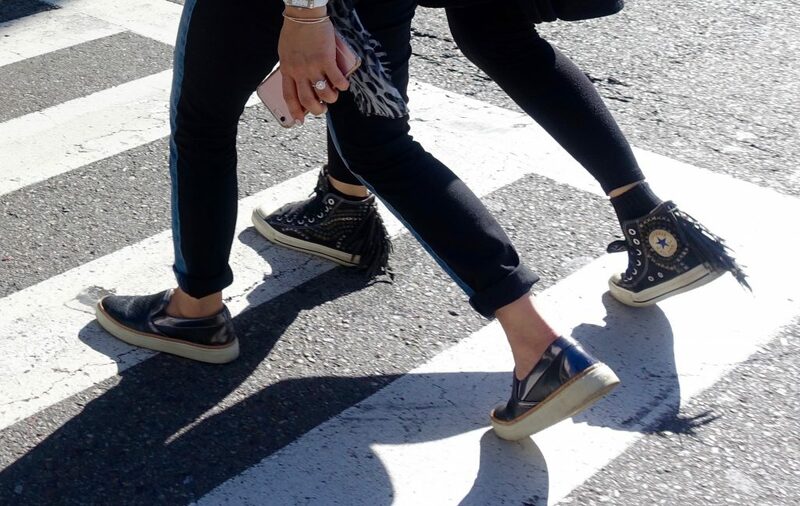 So, here are the fave Converse street style shots we’ve taken from the streets of L.A., New York, Boston, London, Milan, Venice, and Moscow. 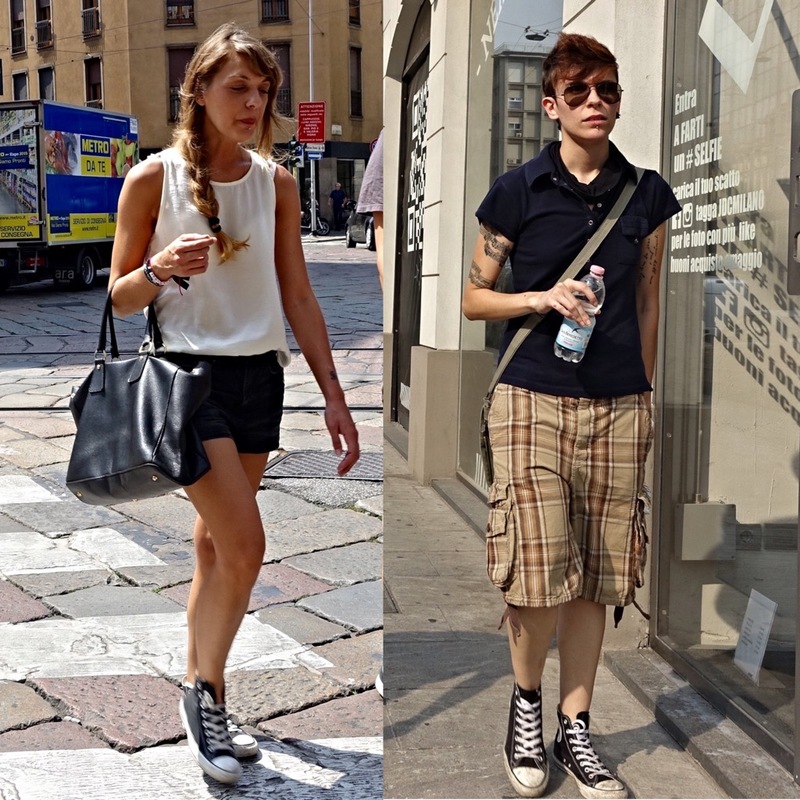 They show 9 great ways of styling Chucks and a couple of things to avoid. exposing a little flesh between the hem and low tops. Julia’s beautiful sister models this easy, modern, and youthful look. Another great thing about this is that it works on women of all different shapes and ages. 2) ‘What about long pants that come all the way down to the Converse?’ you ask. It can be done seamlessly with high tops – either tucked in or outside sneaker tops. For a little fun, switch out your shoelaces for a different color. And speaking of what doesn’t work, long skinnies with Chucks do not work as well on tall, slender women. 3) Converse work with leggings just as they do with skinnies. Plaid Chucks are a super cool option because the lines go every which way, making feet appear smaller. Cropped leggings also help to achieve this effect, as seen on the woman to the left (below). The woman to the right seems to avoid the hockey puck look. I can’t be sure of how she does it, but I’m guessing that it is because 1) she is below model-stature and/or 2) she is one of those people talented at pulling off challenging combinations. 4) And when it comes to other forms of athleisure, what better footwear is there? 5) Heck! Chuck Taylors even work with no pants! Why not? Low tops would also be my choice for a longer leg-line. as long as you wear them in complimentary or matching colors. 7) The same goes for short dresses. Of course, for this girly-girl, dresses are my very favorite way of wearing Chucks. …I love this combination of high-top Chucks with a knit knee-length skirt and leather jacket, all in black. 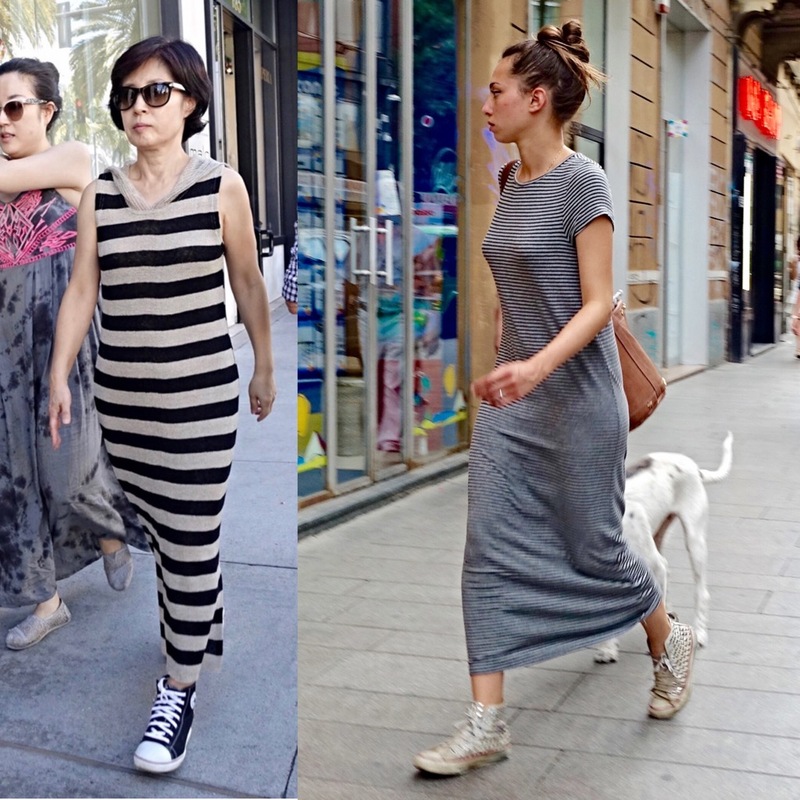 9) Another practically no-fail combination is high-top Chucks with a maxi dress or skirt. The proportions just work out so nicely. 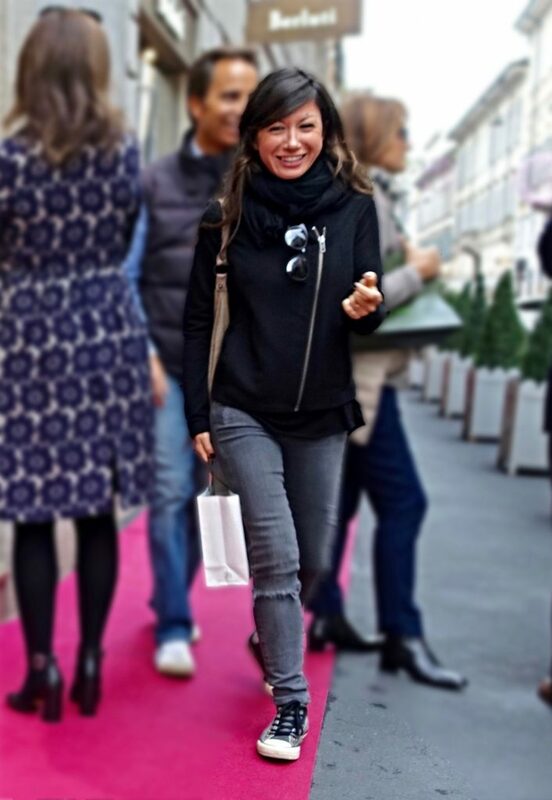 This paparazzi member in Milan’s exclusive Quadrilateral d’Oro shopping district deserved to have her photo taken in a long pleated skirt with contrasting Chucks. It seems that when it comes to street style, Converse are here to stay. So, it’s the perfect time to get inspired on great ways to style them. It’s not exactly a cakewalk to pull off a chic, flattering outfit with Chuck Taylors, although we definitely have winners above. For more tips on combinations to avoid, you might want to check out some Converse Do’s and Don’ts. Psst! Have you heard? Converse has come up with THE CONVERSE ALL START MODERN which is a totally comfy upgrade! You might find them at the official Converse® site or Converse at Nordstrom. Thanks, David. I also think that Converse can look classy! Fun post on Converse sneakers, I enjoyed the pics! Great post and inspirational casual looks! I love the timeless athletic chic vibe of all star sneakers! Thanks for sharing and have a great weekend! Some people can really pull off Converse. I wish I could! I love a good pair of Converse because of their versatility. These styles are amazing, and one can learn good styling from this post.